We return from touring Tuscany, Piemonte and Sicily. France beckons. During our Italy and France Food and Wine tours Uncorked and Cultivated tour leaders focus a great deal on the tastes, styles and method of production of the farmhouse cheese served in our hosting restaurants (goat, cow, sheep). The appearance and shapes differ a great deal, so I am very comfortable with my Italian copy of Slow Food’s Formaggi d’Italia to assist identification. We recently struck a relationship with cheese expert Graham Redhead, a cheesemaking coach for home chefs, he advises on all styles. Graham’s help has been invaluable and we highly endorse his skills and experience. To register your attendance in the east Australia try Cheesemaking to make the curd and see how cheese results. Annually statisticians release data about the drinks industry. While it is pretty dry stuff, we now know USA consumes the greatest volume of wine of any nation. Also described are some fairly frivolous reports of the highest per capita consuming countries. 5th is Slovenia, 4th St Pierre et Miquelon (former French islands 25 km from the Newfoundland coast), 3rd France, 2nd Andorra (tax free enclave) and 1st The Vatican. Clearly the Italian stats are clouded by Papal visitors and further distorted by wine memento sales not for consumption. France and Italy are regarded as the largest per capita consumers as wine is drunk at meal times by the entire family. About the time the Institute of Masters of Wine held its 8th Symposium in Florence early May, the first examples of Tuscany’s new super DOCG classification-Gran Selectione (GS) proclaimed last year-were displayed and tasted. From current reports the GS though intended to be a level above Chianti Classico Riserva, is being placed on existing wine which is in store; few wines currently appear to stand up to this tier of excellence. There is even a lot of criticism about this concept. Prices rise too, yet it is an opportunity to display unique pieces of vineyard terroir which would never be tasted or sold separately. 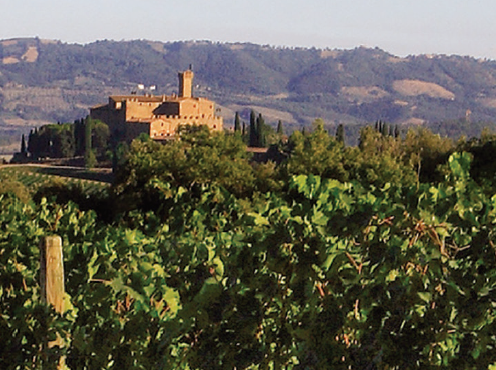 Uncorked’s next visit to Antinori’s Tignanello winery will discover the Badia a Passignano 2009, usually a Riserva, which has been promoted to GS. 35 wines passed the external selection panel for this 2014 declaration (stock ranged between 800 and 500,000 bottles). Rhone producer Guigal’s release of the three hero shiraz viogniers grown on the Cote Rotie, known colloquially as “LaLas” from the vineyards La Turque, La Landonne and La Mouline from 2010 vintage is pushing the LiveX (UK auction scale) to record heights. Trading in luxury wines is similarly documented to trading in equities. Uncorked and Cultivated’s tours visit this fashionable property in Ampuis where the welcome is from Melbourne-born Brett Crittenden, Guigal’s ambassador at large. Philippe Guigal visited Australia recently, presenting us with his entire high-end 2010 range (Lalas included) in a landmark tasting under Negociants Australia “Working with Wine” programme. These are monster wines, aged 48 months in new barrels, making drinks needing years in cellars at about 12 oC working towards ultimate fusion. Predict the wine future – Robert Parker does! Renowned wine critic Robert M. Parker announced his predictions about the wine world for 2014 recently. He used his Twitter account to share his forecast. Well his prediction 9 has blown up. That the Coravin wine preservation “gadget” from the US would revolutionise how we taste rare wine (by taking an extract through its cork). Reports are that some users have experienced bottle explosions. Uncorked was to have received a test Coravin six months ago; so maybe it is safer to not sample test the oldest Barolo in the cellar. Just drink it! Parker’s prediction 3 was “The undefined scam called “natural” or “authentic” wines will be exposed as a fraud-(most serious wines have no additives)” will continue to court controversy. The small international band of natural wine followers is quite vocal. Quite curiously Australia’s wine authorities came down with a heavy hand recently, unconsulted, to outlaw the indiscriminate use of “orange” on Australian bottle labels. They expect to stamp out the potential label confusion with the GI of Orange in New South Wales. The Georgians, who invented this winemaking practice about 6-8,000 years ago, prefer to describe their white wines of this type as “amber”.